I used to coach soccer at Jackson County High School. One of my favorite people on the Earth is a kid named Kyle who played on the boys team. He is about six feet tall, light brown hair and beautiful brown eyes. He has a lot of friends, he studies hard, and he works at his family’s restaurant as a bus boy. 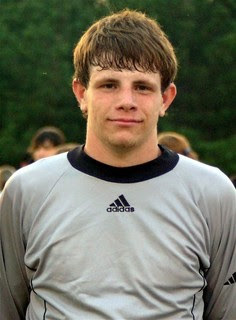 Kyle is the goalie for the high school varsity soccer team. He is an excellent goalie. He can stop a ball from almost any angle. He is able to block penalty kicks and direct kicks with such precision that it looks as if the player intentionally kicked to Kyle. At practice, he is usually the first one ready to warm up and always stays to help collect soccer balls and put away the practice jerseys. He is respected by the other players and coaches and looked up to as a leader on his team. This seems like the average bio of a good student athlete; like the speeches you hear at a sports banquet, right? There is one thing I failed to mention to you about Kyle. He is deaf. That changes things, doesn’t it? Kyle is 100% deaf. I believe he was born deaf and has never had hearing aids of any kind. Can you imagine playing a sport, starting in one of the most critical positions, but not being able to hear the referee blow the whistle when the game starts? That is Kyle’s life. The local news once did a profile of him and started it by showing a clip of a soccer game without any audio. The broadcaster went on to explain that this is how Kyle experiences every game. The news segment was amazing and the comments that Kyle’s coach and teammates said were kind and complimentary. Kyle didn’t hear any of them. Kyle and I had a blast becoming friends. At the beginning of the season, he taught me (and one of my players, Kelli) a new word in sign language every day, like “sea turtle” or “tree”. He would give me pop quizzes on the bus rides to games. I usually failed. But none the less, he, Kelli, and I would always manage to sit together going and coming to away games. I finally purchased, at a yard sale, a kids book on sign language and read it daily to rehearse. He would laugh at me because when I got to practice I would run up to him, fan my hands in his face to get his undivided attention, and then do a simple sign, like “boat”. He would say, “Good, Coach. A boat.” Like I was a first grader or something. It was hilarious. Kyle was killed in a car accident last night. 1 week from graduation. I am heartbroken.